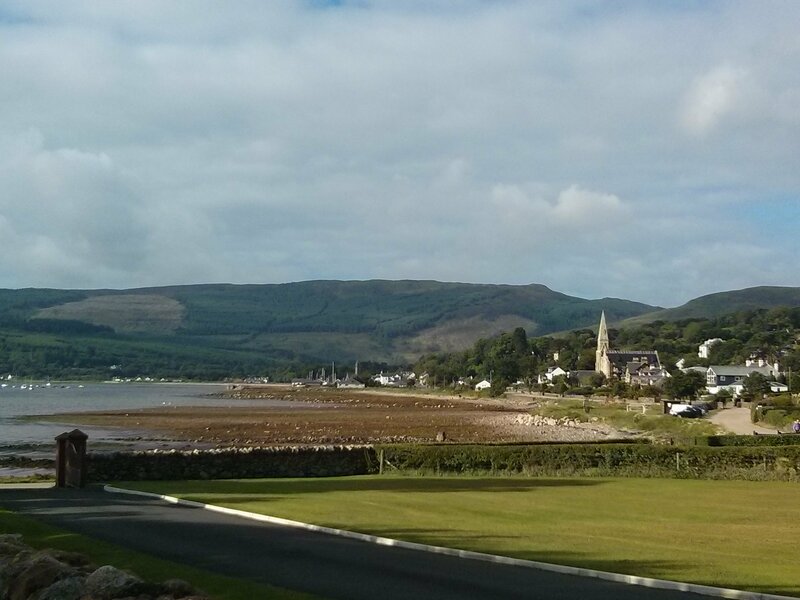 A beautiful island escape for a weekend away from Glasgow awaits on Arran. 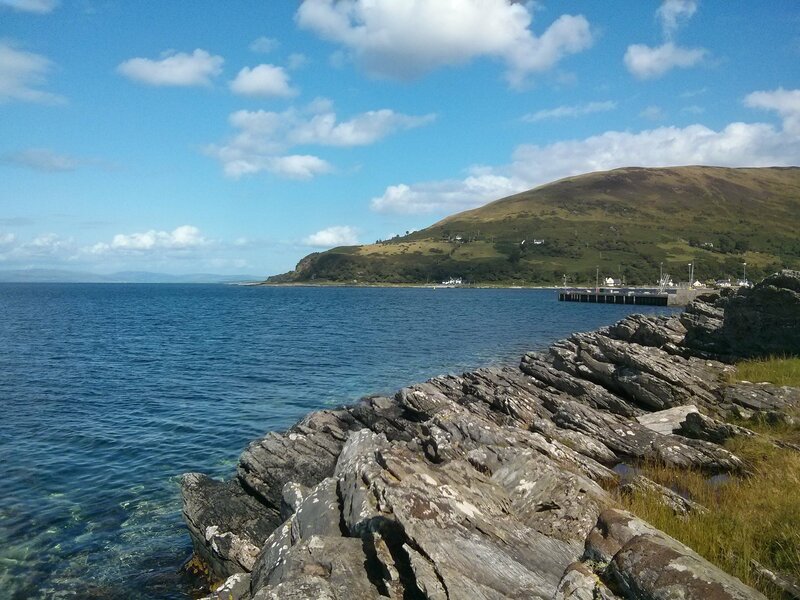 Last summer, I spent a weekend on the lovely Isle of Arran. From the whisky distillery to the island’s famous bath and body boutique, there’s something for every taste. But wait, is whisky gluten free? I’ll tell you! You may think that a small island is a tough place for dietary requirements, but I found my gluten free Arran trip to be pretty easy! Arran is often called “Scotland in miniature.” This is because the island’s geography mirrors mainland Scotland’s. The north is rocky and mountainous, while the south is more pastures and gently rolling hills. The entire island is 56 miles in circumference, with a ring road that follows the coast all the way around plus a road running west-east across the center of the island. Incredibly, there is also a ton to see on this small island, which has castles, a distillery, golf courses, shopping and lots of outdoor activities. Getting to Arran is pretty easy, too. From Glasgow, either drive or take the train to Ardrossan Harbour. The train station is just steps from the ferry terminal. Buy the appropriate tickets for the ferry and walk or drive on. The ferry journey takes about an hour to reach Brodick, which is “the big town” on Arran. The Brodick ferry terminal is also the bus terminal, so if you’re on foot, this is where you’ll link up with the buses to get you wherever you need to go around the island. If you’ve got your car, getting around is quite easy. If you’re on foot, you’ll need to rely on the bus system, which is reliable but somewhat infrequent. Get a bus schedule and always double check with the driver when you get on the bus that you can get to where you need to go (the bus parking system at the terminal is confusing and the buses are all numbered similarly!) The bus will get you to all the towns on the island. I also noticed that people would ask the driver to stop in seemingly random places – it turns out, they’ll drop you at trail heads (or if you’re a local, at your front door) even if it’s not an official stop. I was also told that you can flag down a bus even if you’re not at the stop, but I didn’t try this. Locals also told me it was safe to hitchhike (and a lady in the grocery store offered us a ride when she overheard us talking about how to get to our hotel) but again, I didn’t try this. I certainly wouldn’t rely on that as a first choice, but if you find yourself absolutely stuck, it’s an option. Note that there’s only three bus runs on Sundays, so plan your visit carefully and watch the time! If you miss your bus you could miss the ferry off the island too. Brodick’s most popular tourist destination is Brodick Castle, Garden and Country Park (according to TripAdvisor). It costs £12.50 for an adult. The Castle is open from April – October, so skip this in the winter. I didn’t go as I had other things I wanted to see, but it sounds really cool. In the town itself, you’ll find several shops, a grocery store, and plenty of restaurants. We had dinner at Fiddler’s Music Bar and Bistro, which accommodated both my gluten free diet as well as Legend’s vegetarian requirements. The food was nothing special, but it was safe and that counts. It’s a small place, but they somehow managed to fit a cèilidh band in the front corner. If you’re visiting on a summer weekend, dinner reservations (bookings) are essential. I found this cool path when I walked down the road from the Home Farm Visitors Centre. Home Farm has a bus stop right in front of the Arran Visitors Centre. This was the first place I went after arriving on the island. Since it was lunchtime, my first stop was Creelers Restaurant. It’s a lovely seafood restaurant which also has a smokehouse (you can buy smoked fish products to take home as well, though you’ll need an ice chest or a refrigerator in your room!) They were easily able to accommodate my gluten free requirements. Once I was full, I set out to explore the shops in the visitor centre. My first stop was the Arran Aromatics Factory Store. Arran Aromatics makes bath and body products and a line of home fragrance items. The factory store has pretty much everything they offer, and you can get some good deals in their sale and clearance areas. (I got a bunch of little hotel-sized lotion bottles for 10 pence each! Hello, souvenirs for the office.) The fragrances they use are all inspired by the island and they have products for men and women. It’s really nice stuff and definitely worth a visit! Also in the centre, you’ll find Friday’s Child, an eclectic gift shop well worth a wander. They had everything from stationary to kitchen items to candy – you’ll find things you didn’t know you needed. At the end of the centre is the Island Cheese Shop, where you can sample the local cheeses. The shop also sells unique food items and gifts, so even if you’re not a big cheese fan, it’s still worth a quick stop. I had some time to kill before the next bus, so I walked down the road a bit and stumbled on to another little area of shops with a restaurant and wine bar. 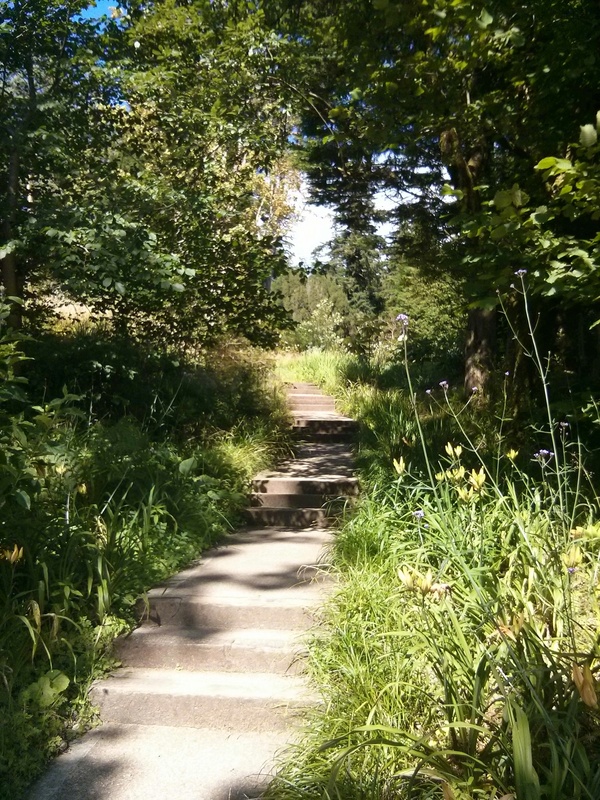 There’s also some lovely trails around the area, but be careful as eventually you’ll reach an area where you need to pay (I think it was the back of Brodick Country Park, now that I think about it.) You’re really close to the water and can get down to the beach if you want to! The Isle of Arran Distillery is an essential stop on the island. 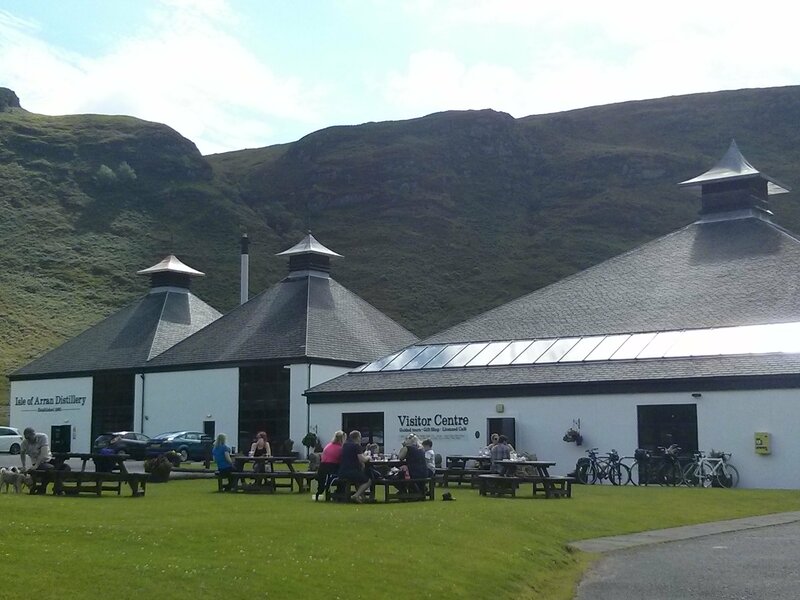 If you’re a fan of whisky, this is an essential stop while on the island. The distillery is on the north side of the island near Lochranza and has its own bus stop. The distillery has a variety of tours, from the basic to the “luxury VIP experience.” Consider booking ahead of time if you’re going on a summer weekend or if you want to do one of the more expensive tours. We passed on the tour but instead did a tasting of our own in their on-site café. We ordered a cheese board and purchased a whisky sampler, which included four drams (samples). The restaurant is a nice place to relax with a drink and a little bit to eat. 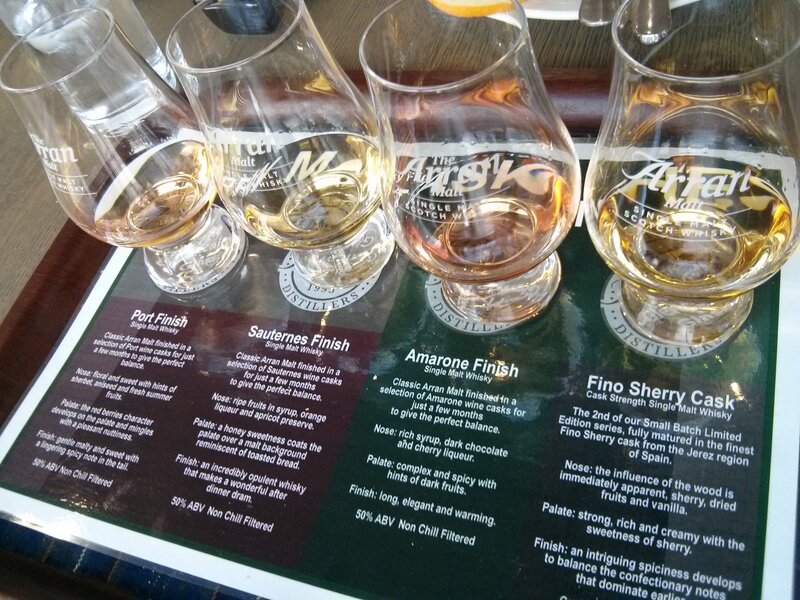 While you’re here, make sure you try Arran Gold – it’s a cream liqueur made from whisky and it’s delightful. The distillery also has a gift shop where you can buy your favorite bottles to take home with you (even minis!) The grounds are lovely as well. 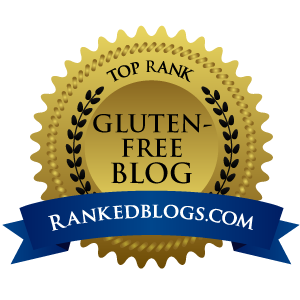 But wait – is whisky gluten free? We shared a whisky sampler in the restaurant instead of taking the distillery tour. According to many sources, including the National Institutes of Health and celiac.com, distilled alcohol is gluten free, regardless of the source grain. Whisky is made from malted barley. The Scotch Whisky Association says “proteins (including gluten), however, do not carry over the distillation process and are not present in the final product. Scotch can therefore be safely consumed as part of a gluten free diet.” Coeliac UK says the same thing. However, it is apparently somewhat common practice to seal wine barrels with flour paste (see Fearless Dining’s full explanation). Since whisky in the UK is distilled in barrels previously used for something else (usually bourbon, but as you can see above, it’s sometimes finished in other barrels used for sherry or port wine.) In theory, there could be trace amounts of wheat on these barrels from the seal and if you were really sensitive to gluten it could be a problem. In my experience, I haven’t reacted to any whisky I’ve tried in Scotland (and I have tried a lot.) However, I also don’t have a celiac diagnosis, and there is a lot of variety in how sensitive people are. If you’re worried, talk to the experts at the distillery, and if you’re still not convinced, skip the drinks! It’s still worth a visit to the distillery for the food and the scenery. We really only spent the night in Lamlash and saw a little of the town the next morning while waiting for the first bus back to Brodick. There are a few shops and restaurants, most of which were closed on a Sunday morning. We stayed at the cabins at Altachorvie Island Retreat. They operate a hotel in the main building with low-cost cabins in a building in the back. The cabins are really, really simple – we did not particularly enjoy them, but they were cheap (relatively) and available last-minute. For an extra fee, you can eat breakfast on site (gluten free was no problem.) Wherever you stay, make sure you make your reservations with plenty of time to spare! The reason we were on Arran was because it’s the closest place to Glasgow where paragliding is an option. I am not into it, but Legend has been flying for some time and took several lessons with Flying Fever. Again, this is seasonal, with paragliding weather from roughly April to October. They pick you up and drop you back off at the ferry terminal in Brodick, and they go wherever conditions are best on the island. Reservations are essential. 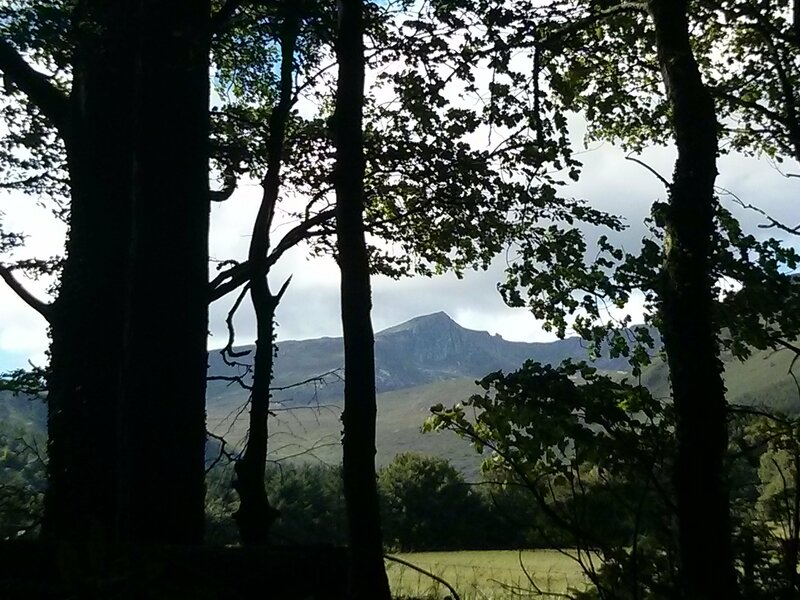 Arran is also a great place for the outdoors, and if you’re into hiking or biking, you’ll find plenty to do here. Cyclists use the same ring road around Arran as the cars and buses, which I thought was a bit terrifying. We saw tons of people on bikes throughout the weekend, so clearly the locals are used to it! I was alone for most of the trip while Legend was paragliding, so I passed on hiking, but here’s some information about where to hike. I decided to try to take the bus all the way around the island, but I ran out of time and only made it less than three-quarters of the way (I missed most of the west side.) I didn’t see much to do on the south side of the island and I got pretty car sick on the bus, so I can’t say I would try this again. Get back out the way you came in – by ferry (on foot or in your car). Pay attention to the time schedules, especially on Sundays, so you don’t find yourself stuck on the island! My top tip for Arran is to pick up a transportation schedule (I found one on the ferry to Brodick.) It included bus, ferry and train connections to Glasgow. If you’re going on a summer weekend, it is a popular destination and you’ll need to make your hotel and dinner reservations early. If you’re planning to do any tours, you’ll want to reserve those in advance as well. Do not find yourself on an island with no hotel reservations or options for dinner! (Though, there is a grocery store, and you could always camp I suppose!) Pay attention to the weather forecast, as the ferry doesn’t run in bad conditions. Definitely take your camera, as the diversity between the northern and southern island environments will surprise you! Have you ever been to Arran, or any of the Scottish Isles? What are your top tips? This sounds like a wonderful trip and one I’d like to make one day. My one and only trip to Scotland was to Edinburgh a few years ago. There’s so much to see in Scotland, I hope you get a chance to visit! It’s dead easy from Glasgow, an hour on a train and another hour on the ferry.